When I joined the Pembroke club in the early 1950’s I immediately became aware of the talent of one runner in particular. In fact, Ken or Kenny as I liked to call him, was the winner of the first club race I ever saw, the three mile track championship. he led home a squad of fine runners, but more of that later. performance) Martin McLoughlin of the mid70’s to 90’s period. Both these fine runners won bronze medals in the National Cross country and represented their country in the International. Kenny shared that honour of international representation for England in the 1950’s. The finest tribute you could pay a bloke in those days was that he was a good club man. Kenny was certainly that. 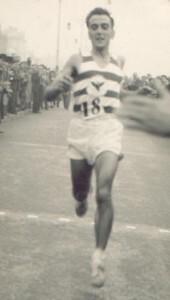 He helped establish the reputation that Pembroke earned as one of the North’s finest distance running clubs of the 50’s decade. I know he want me to mention those close team mates he battled and invariable led home, names such as Arthur Price, Geoff Prescott, Jack Highton, Eddie & Ronnie Williams, Barry Juxton, Sid Black, Sammy McIver, Les Hollingworth, Ron Perry, John Robinson, George Radcliffe, Harry Sholicar, George Warriner, Tom Beesley, Terry Dwyer and Colin Camden in later years. My apologies to those I have forgotten, for my memory dose fade. The club statistics for that period were most impressive and Kenny led that search for excellence, there always has to be a BEST man to chase and he was the one. Some of the club achievements included. In his later years, after retirement from running, Kenny advised many Pembroke juniors to success, but that is a tale for some other to tell. My everlasting impression of him will be watching the Inter Counties Cross Country Championships over seven miles at Childwall in 1955 (I think) All the big guns represented their county in those days. The course was dangerously icy and snow covered. From the start ken Norris and Gordon Pirie were at it hammer and tongs. Suddenly, at about three miles, our Kenny shot from 12th to 3rd place and then surprised us all by taking the lead. he held it for almost two miles, then faltered and fell back to forth spot, some 50 yards behind Norris and Pirie. In the last mile Norris broke away and Pirie seemed to relax, whereupon Kenny upped his pace and blasted past him to take second place. How proud those Pembrokians were, athletes and officials alike. the latter began to mention him in the same breath as Norman Jones. an honour indeed. It was a privilege to know and run with him, I was blessed to see him just recently after many years apart and I shall miss him greatly.